Got the RF-7 II yesterday. Here are some initial impressions vs. my recollection of the RP-280F that I sold last week. The have the black B-stock veneer, but the veneer is flawless. I have no idea what why they would be considered B-stock. These things are large and in charge. The have a commanding visual presence. My wife and daughter are out of town visiting my wife’s sister. My oldest son is staying with my parents this weekend. So, it’s just my youngest son and me at home this weekend. This allowed me to do about 5 hours of break-in at a decent volume without bothering anyone. I watched several tracks from 3 concert videos last night after the 5 hour break-in: Clapton Planes, Trains and Eric blu-ray, Cream Royal Albert Hall blu-ray, and Eagles Hell Freezes Over DVD. The system is 2-channel for A/V purposes in a large family room. A Rotel RX-1052 supplies the power and an Emotiva DC-1 handles DAC duties. First, the bass. Wow! It hits hard and deep. No contest vs. the RP-280F. The bass hits you in the chest as if a good sub (or subs) were playing…and this in in a pretty big room (approx. 18’x50’) that is open to other rooms. The RF-7 II create some sympathetic buzzes and rattles in the room that I will have to address! Second, no fatigue from sharpness like I had at times with the RP-280F. This is huge because I had some concerns that the RF-7 II would be as or more fatiguing than the RP-280F. I wonder if the higher horn position on the RF-7 II is a factor; the horn is well above ear level when seated. So far I am very impressed with the RF-7 II and consider them a substantial upgrade vs. the RP-280F. More to come as I get more time with them. 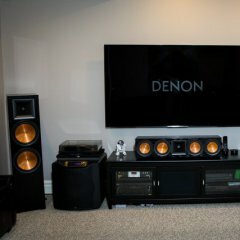 Nice review, the RF7lls are awesome speakers for sure. What else can you say, it is the Reference Flagship! It is nice to hear that you like it. I remember my first impressions of the RF-7ii after unboxing them and setting them up to replace my RF-62ii. They sounded better, but not by a dramatic amount. But they just had a presence to them...both physically and sonically. They are just impressive to look at and the build quality immediately makes you forget about any second thoughts you may have had when placing the order. The one big thing I noticed with the upgrade was the complete lack of fatigue when listening to all types of music/movies. I would occasionally get headaches listening to the 62's for any prolonged period. The 7's have never given me that feeling. I know there are better speakers out there, but I've never even had a passing thought of upgrading since setting them up. Viewing into one of the ports, I noticed that the RF-7 II woofers use T-nuts for mounting to the baffle. That is a nice touch that I wish was standard on more speakers. MDF is a pretty crappy substrate for screws. 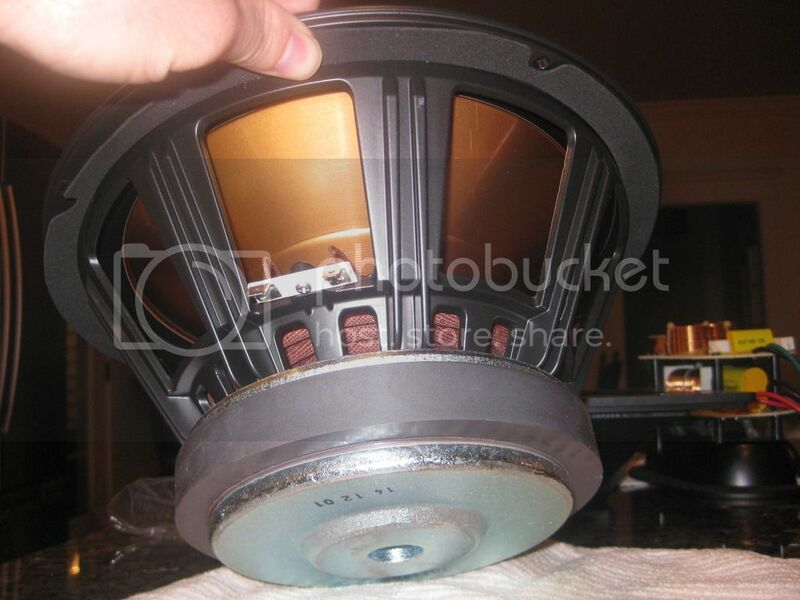 Can anyone confirm whether the woofer baskets are cast aluminum? Also, this may sound a little strange, but I love the smell of the finish when I walk by them. I just like how some of the sounds with music just float in the air. I have heard other speakers that make a good initial impression but, have not heard any that I would really consider swapping out for the 7 II's. Some sound different but, are they truly better? The 7 II's are just a well designed speaker from top to bottom! The only thing I don't like about the 7ii is the horn is a little brash if it is pointed right at you, and, in a home theater setting, it's going to be pointed right at somebody. Multiple people have noticed this. Two channel guys tend to point them to the outsides more than usual because of this. By this, do you mean the 2-ch guys are toeing them out vs. facing them straight ahead or toeing them in. Mine are currently toed in such that I can't see the the inside panels when I am about 3 ft behind the main listening position (they converge around 3 ft behind my head). With this level of toe in, I have not found them to be brash, whereas I did find the RP-280F to be brash at times. I have not varied toe-in beyond the original placement because I'm getting a nice center image, fairly wide soundstage, and have not experienced brashness so far. I'm saying that they tend to aim them at the outside of their shoulders rather than right at their face or a little in front of them like some people do. They're still toe-'ed in a little but not as aggressively. I'll be working on my review of the 280 vs 7ii. Haven't had a chance to actually sit down yet. They are actually very similar in nature, but the 7s have a deeper, larger tone. I have heard some of the high end B&W and they are nice. Just like Goldenear Trition I's. The best way to say it, they are different and may favor a strictly music application. The 7 II's are a complete speaker also. It depends on what you are really looking for. The RF 7 II's can hang in there with speakers costing 3 or 4x as much. But, then you are getting into certain wood finishes, ect. @Speakerklipschman I had written a quick summary in this thread...not sure how to link to it. It's really up to you whether the difference is worth the cost. The 280 and RF-7II are close in nature. I'm betting they looked to match the 7 more closely with the new line. The 7, however, has more of everything. Bigger soundstage, presence, punch, detail. The 280 may be slightly smoother. Personally, I haven't liked any B&W speaker I've heard, so i can't comment on those vs the 7. Speakerklipschman, IMO, the performance jump from RP-280F to RF-7 II is worth the money, especially if you can get the RF-7 II for $1,800 or less. No doubt that the RP-280F is a lotta speaker for their $800-900 street price, but the RF-7 II is a lotta, lotta, lotta speaker for $1,800 or less. With the current pricing on these and adding a Crown XLS2502 and Outlaw 975 pre/pro to my current R28F's i feel the 7's will be awesome! I’ve read that the RF-7 II share a bit more Heritage DNA than the other Reference models do. I don’t know much truth there is to this though. How to the RF-7 II compare sonically to the Cornwall III? Are the Cornwall III a significant step up or more of a different flavor? RF-7ii's aren't going to sound anything like B&W's. Whether that's better worse is a matter of opinion, but buying RF-7ii's in hopes that it will sound like a B&W doesn't make much sense. I do think it is well worth the upgrade from the RP's, especially if you are starting out from scratch and don't have to ditch an existing set. The exception is if Atmos is a big priority. The RP-280FA is a superior solution to RF-7ii's with the modules on top. The 7's still sound better from the normal tower but as an Atmos solution, the 280-FA is pretty nice. Eh, they're quite a bit different from the Heresy. I have both, in adjoining rooms. On the Heresy, what I would call the low midrange is better due to the 3 way design, bass seems tighter and punchier due to the pro audio 12" in a sealed box but has less extension, and super high treble is a little more piercing due to the smallest tweeter. On the RF-7ii, upper midrange or low treble almost seems exaggerated which is what makes the horn section really shine with that Klipsch sound that everybody loves plus cymbals are heavenly, bass has more extension and can sound as good as small subs but isn't quite as tight as the Heresy. I think the RF-7ii is a better rock speaker. I like the Heresy better on flamenco and acoustic guitar stuff. I do kill the super high end a little, but I'm hyper-sensitive at 8 kHz and above and hear stuff that most other people don't.